During the Prime Minister Dr Lotay Tshering official talks with the Bangladeshi Prime Minister at the recent four-day official visit to Dhaka, he reported to the Bangladeshi counterpart that the government needs to relook Bhutan’s stand on agreeing with the BBIN Motor Vehicle Agreement. 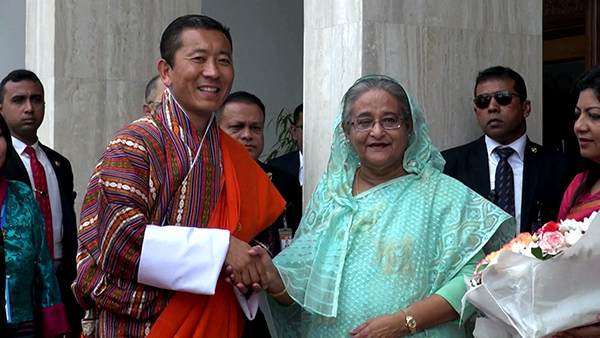 The prime minister also said Bhutan and Bangladesh are positive on approving a trilateral agreement with regards to the export of electricity from Bhutan to Bangladesh. He said Bhutan will sit with Bangladesh and India before the countries can sign a trilateral agreement on import of hydropower by Bangladesh from Bhutan. “In the first place, Bhutan having huge potential in hydropower is something we are reviewing very seriously. That’s what I told to the Bangladeshi government and I stand by that. Also, I told the local media how much potential we have is not really assessed,” he added. Meanwhile, the two governments are also working on the practical implementation of the Use of Inland Waterways for Transportation of Bilateral Trade and Transit Cargoes. The two countries adopted a Standard Operating Procedure at Dhaka last week. “We have agreed rightly as they proposed that a team from our economic affairs ministry to visit Dhaka during the arrival of the first consignment and we agreed that our economic affairs minister will also be there,” the prime minister said. Meanwhile, Dhaka announced an additional five scholarships for Bhutanese students in government medical colleges in Bangladesh as per the agreed joint statement between Bangladesh and Bhutan. This will take the number of scholarships for Bhutanese medical students to 15.